Here at ACK, we looooove dogs. In fact, you can find at least three dogs in our office on any given day. As lovers of animals and the outdoors, few things warm our hearts more than photos of dogs enjoying our kayaks. We wanted to share some of our favorite paddling pups with you. If you’re considering taking your pup out for a ride, check out these customer photos and reviews for some inspiration and recommendations for the most dog-worthy kayaks. And remember, safety comes first for your little best friend. Be sure to pick up a life jacket for your dog before taking them out on the water. This adorable photo comes from a customer who spent five days kayaking and camping at Fontana Lake, NC. Just her and her beautiful pup. She and her dog are loving their Advanced Elements AdvancedFrame Convertible Tandem Inflatable Kayak. This handsome boy’s name is Gusto. He loves kayaking! Gusto’s owner says that his Ocean Kayak Scrambler 11 Kayak is “the perfect size for man and dog.” Ride on, Gusto! This pretty pup had a great time sightseeing on the Caladesi and Honeymoon islands off the coast of Florida. She cruised around the islands in her Feelfree Moken 12.5 Angler Kayak in popping pink. Check out this squad! This lovely dog mom recently rented one of our FeelFree kayaks and is now considering purchasing one of her own. She enjoyed her rental Feelfree Corona Tandem Kayak so much that she is “seriously considering buying one and wanted to show those thinking about it how well it did with 1 person and 2 50lb dogs.” That’s what we like to hear! 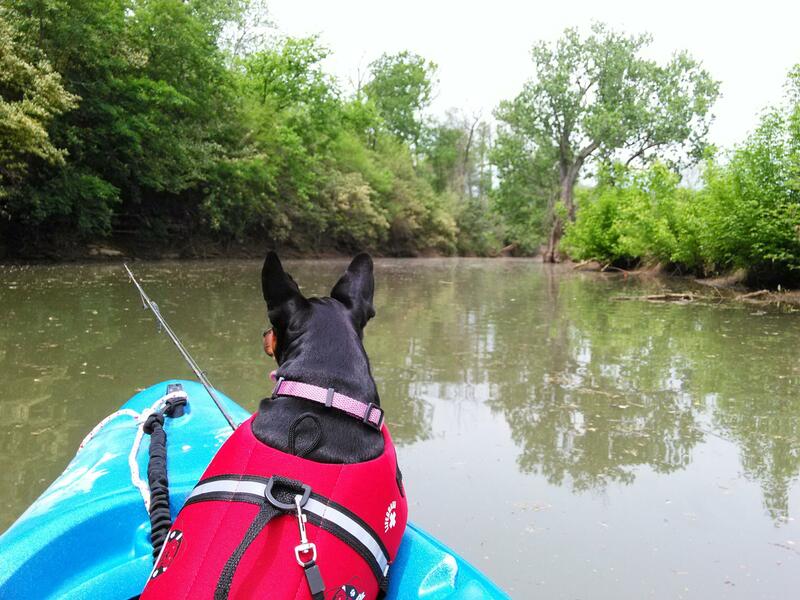 A focused dog angler trying out her new kayak on North Elkhorn Creek in Kentucky. Featuring the Old Town Vapor 10 Kayak. I wonder what she caught? Molly, the little dog with a big heart, loves going for adventures in her new Wilderness Systems Tarpon 160 Kayak. Float on, Molly! Got dogs that love kayaking? We’d love to see them! Send us some photos of your adventures with you and your best friend via our adventure collector for a chance to be featured in our upcoming blog posts.